Holy blue freakin’ Hannah, I finally have regular computer access again! After a trip out to one of them there big-style computer places, I’m the proud owner of a spanking new laptop, whom I have named Magnus (after the famous Robot Fighter, natcherly). Now at this point, I’m well behind in reviewing stuff that I’ve seen, and some of it may indeed fall by the wayside. It’s completely too late to write about Obviously A Theatre Company’s excellent A WALK WITH MR.MCGEE, which I caught on the second-last day of its extended run at the Bytown Museum. Suffice it to say all of Ottawa should be watching to see what they do next. What it is NOT too late to write about, is the latest offering from sort-of newbies Bear and Company, their touring production of Wm. 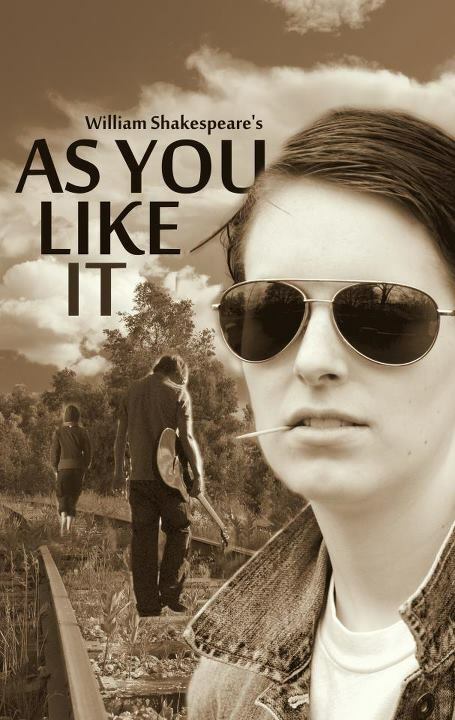 Shakespeare’s AS YOU LIKE IT. I say ‘sort of’ new, because the company is comprised of a host of seasoned actors, headed by Eleanor Crowder who recently evolved their way out of Salamander Shakespeare and struck out on their own. I caught their action last week, my appetite having been solidly whetted with their Fringe production ‘TIS PITY SHE’S A WHORE, which sold out its entire run. And my apologies to the Bear gang for being so tardy with my review, but I promise it isn’t out of a lack of enthusiasm. Seriously, there’s tons to enjoy in this Will Somers-directed bit of Shakespeariana. Telling the tale of a pair of would-be lovers, individually exiled from their homelands, and updated stylistically to 50’s-era America (which lends itself to some pretty funky costumes), AYLI stars Zach Raynor as Orlando, the youngest son of a great lord, now put-upon by his domineering older brother Oliver (Leslie Cserepy). After a spirited match with court wrestler Charles (Nicholas Amott, mugging it up but good), Orlando catches the eye of beautiful Rosalind (Anna Lewis, who also doubled as costume designer), who is about to be cast into exile by a vengeful duke (Eleanor Crowder herself, who digs into her villainy with glee). With her sister (Dyna Ibrahim), and the court fool (Somers), Rosalind flees into the woods, disguising herself as a beatnik Fonzie to ease their passage (it makes sense when she explains it, trust me). Things get complicated when Orlando shows up, and Rosalind decides to continue her pretense of masculinity. Things get even MORE complicated when Orlando finds Rosalind’s Mother in the woods (Crowder again, playing the good mirror to her evil alter-ego the Duke). Things then get their complicated-est when flighty farmgirl Phoebe (Danielle Savoie) falls head over heels for Rosalind (in her male disguise of Ganymede). Never let it be said that Shakespeare didn’t like juggling a lot of balls at once.